Did you see yesterday's collection of spring fine motor activities? Today we're back in our Spring Week series to bring you 5 full days of Spring Occupational Therapy Activities. 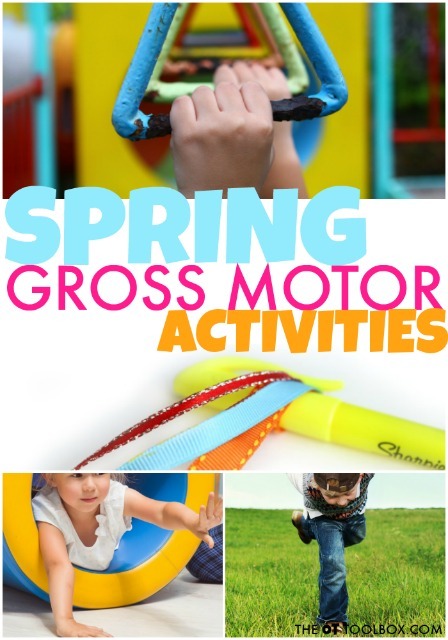 Today, we've got gross motor ideas that have a Spring-theme. You'll find throwing activities, ways to work on the eye-hand coordination needed for catching a ball, bilateral coordination ideas, core strengthening activities, and more. These are the gross motor skill ideas that you can use in so many ways to address the skills kids need to succeed at home, at school, and in the community! Get the ideas below! First, just in case you missed our Spring Fine Motor Activities collection, you can check them out here. Be sure to stop back all week, because we're loading you up on different ways to address developmental skill areas with a Spring-theme. Here is the main page of Spring Occupational Therapy Activities so you can find all the goodies this week. You'll want to bookmark or pin that page so you can refer back to it all season long! 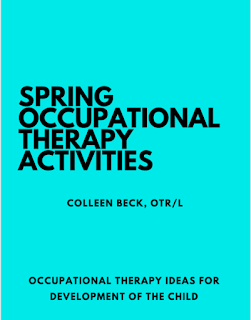 Remember, if you are looking for fun ideas to incorporate into therapy sessions, at home, or in the classroom, our Spring Occupational Therapy Activities Packet is on sale right now. It's 26 pages of spring ideas for addressing sensory processing, gross and fine motor skills, visual motor skills, visual perceptual skills, handwriting, and more. The packet will last you all season long and can be used over and over again. Grab the Spring Activities Packet here. 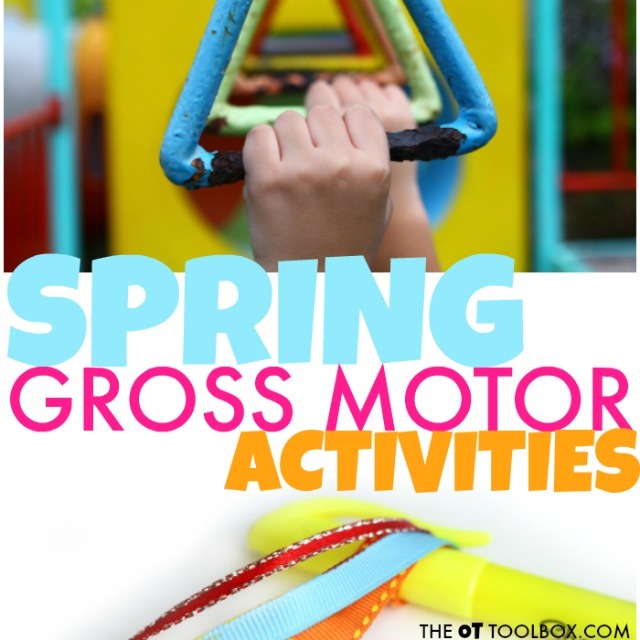 Spring week continues on The OT Toolbox and today is all about those Gross Motor Skills. Shoulder and wrist stability are such a necessary part of fine motor control and precision. You've probably seen it before; a kiddo that writes or colors with their arm "floating" up off the table surface. 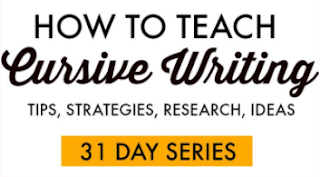 You probably know a child that writes with their whole arm as opposed to moving those fingers. You might recall a child manipulating small items like beads with their elbows smashed into their sides in order for them to have support and control...It's all shoulder stability that is lacking! We're also talking about core stability, postural control, and balance. You might know a student that slouches at their desk. What suffers? 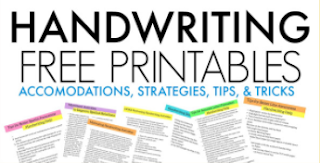 Handwriting legibility, reading comprehension, and the ability to copy materials without missing items. 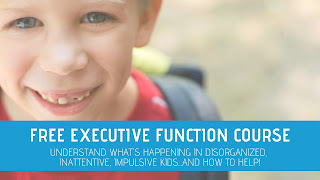 You may have seen a kiddo that is fearful on uneven surfaces like when maneuvering on bleachers, or struggles with active games in gym class. What may be the culprit to these coordination skills? It just might be postural control, core strength, and stability. The gross motor activities below provide opportunities to improve bilateral coordination, core strength as part of improving postural stability, balance, coordination, shoulder stability, and shoulder girdle strengthening. The activities follow a Spring-theme to use this time of year. Create a Bunny Hop Gross Motor Game much like our Dinosaur Gross Motor Game! Just make the activities actions like Hop like a bunny, jump like a bunny, stomp your bunny feet, etc. You can add other spring animals too, like a lamb, baby chicks, or robins. Make a DIY Dance Stick using ribbons, crepe paper, and string. Then, practice forming letters or writing spelling words with the dance stick. It can be decorated like a May Pole, too. Incorporate bilateral coordination and eye-hand coordination to wrap the stick with ribbon all the way up and around a dowel rod. Bean Bag Activity- We made ice cream cones, but carrots would be super easy, too...or just pretend the bean bags are carrots :) Here are some bean bag games to use when working on midline crossing, core strength, motor planning, and other gross motor areas. Shoulder stability is an area that so many kids can struggle with! Writing with their arm "floating" up off the table surface, using the whole arm to manipulate and move a pencil, and other small motor actions. Sometimes, kids that do activities and tasks quickly are compensating for weakness in the shoulder girdle. Use Wikki Stix to build Easter Eggs by sticking them to a wall. Position the child at a seated position facing the wall so shoulder flexion occurs at eye height. This is a great way to work on shoulder and wrist stability and mobility. Use Spring cookie cutters and small pieces of chalk on a chalkboard or easel. This activity is great for drawing and writing at shoulder height and uses both hands at midline. Working at the vertical surface promote core strength as well as shoulder stability and wrist extension. Bunnies, Easter eggs. hearts, and colorful circles or rainbows are fun this time of year. Try Spring Yoga- There are some Yoga positions with a Spring theme described and listed in the Spring Occupational Therapy Activities Packet. Add fun animal names and positions to basic yoga positions. Use a scooter board in prone. Push and pull the scooter board across the floor to transport Spring items into a basket. The dollar store is a good place to find small items. Better yet, use bunny tongs or other tools to transport the items. Roll a small ball or a therapy ball up and down a wall. Use painters tape to make a ball maze or a strait line like the stem of a Spring flower. "Walk" the ball up the wall to shoulder height and then back down again. Get the ball to the top of the step to create the flower! Spring Animal Walks- Do the bunny hop, frog jump, and lamb crawl from one side of the room to the other. Think: wheelbarrow walks, crab walks, donkey kicks, and bear walks with a Spring theme! Color or play on the ground- Use Easter grass to create a sensory space on the floor. Use a large, low tray such as a jelly roll pan to create a sensory bin. Kids can use tongs to find hidden items such as mini-erasers. Posture and trunk stability is essential for positioning in the classroom and in functional tasks in general. Postural control is needed to enable the student to sit upright at their desk, allowing for better handwriting, reading, and copying skills. Kids who struggle with postural control and balance will be uncoordinated in fine motor tasks, activities requiring sustained positioning, have trouble with motor planning, and may be fearful of tasks that require mobility or uneven positioning such as manueving on bleachers or during active play. Spring Caterpillar Pose- Assume the "superman pose" on the floor, but call it a caterpillar pose! You can be a caterpillar in the SPringtime, gaining strength to start crawling and munching on leaves. Relax rest but then return to the extended arms, legs, and head positioning as you wake up again! Balloon Pass- Lie on your back and pull the hips and knees into flexion, toward the belly. Try to hold a ball or balloon between your feet. Then, pass the ball to a friend lying opposite on the floor. Pass the ball into a hoop or large basket. Egg Pass- Sit on a partially inflated beach ball and try to balance a plastic egg on a spoon. Try to pass the egg to a friend and then drop it into a basket. You'll also be interested in our newly updated Spring Occupational Therapy Activities Packet. It's a 26 packet of activities with strategies to grade up or grade down the ideas to meet the various needs of a variety of kiddos. You'll find ideas to work on visual perceptual skills, sensory processing, handwriting, fine motor skills, gross motor skills, bilateral coordination, motor planning, and so much more! The packet is only $7.99 and can be used over and over again for every student/client! Spring Visual Perception Worksheets- Print these off and slide them into a page protector. Use them to work on visual perceptual skills like form discrimination, visual closure, figure ground, and visual processing skills like tracking, scanning, etc. Use manipulative items to work on fine motor skills with these worksheets such as play dough, slime, Wikki Stix, yarn, craft pom poms, or other items. Spring Fine Motor and Gross Motor Activities- Add these ideas to therapy home programs to work on pencil grasp or core strength. Use these ideas in therapy warm-ups, or to add movement to a child's day. Spring Themed Brain Breaks- Cut up these cards and use them to add movement and motor skills into the classroom or home. It's a great way to re-charge! Spring Themed Handwriting Practice Prompts- There are two pages of writing prompts that are ONLY in list form. That means kids don't need to write out sentences while working on letter formation, spacing and size. They can work on all of the handwriting skills they need in a short list that is interest-based, making it motivational for them. And, the list format is a quick way to sneak in handwriting practice! OT Homework Sheet- Sometimes, it takes extra practice to make skills "stick". 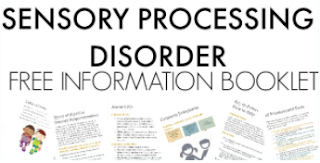 When parents help in practicing therapy activities, it can make a difference in carryover. You'll find a done-for-you OT homework sheet to use in weekly homework activities OR for use as a home exercise program! Client-Centered Worksheet- When our kiddos have a voice in their therapy, carryover and goals can be more meaningful to them. Use this worksheet to come up with Spring activities that meet the needs of a child, while taking into considerations that child's interests and strengths to make activities meaningful. Sensory Activities and More- All of these extras were added to the already well-rounded Spring packet that includes activities designed around each of the sensory systems. You'll find 13 pages of proprioception activities, vestibular activities, tactile activities, oral motor activities, etc. And, they include ideas to extend the activity to include eye-hand coordination, body scheme, oculomotor control, visual perception, coordination, and motor planning. This Spring Packet has everything you need for the next three months! 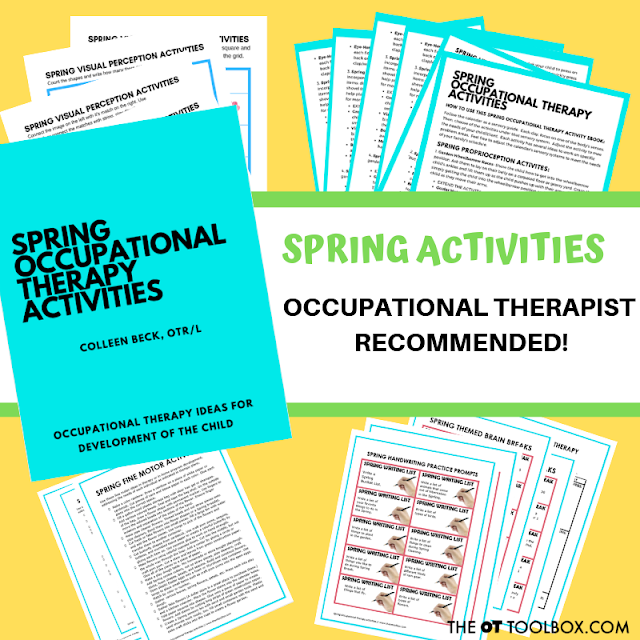 Click here to grab your copy of the Spring Occupational Therapy Activities Packet for only $7.99. Note: These activities and suggestions are provided in an educational manner. Completion or participation in the activities listed here do not indicate therapy intervention nor should be used in place of therapy. Always consult an evaluating occupational therapist or physician regarding exercise and activity programs. In the case of physical delays or diagnoses, always consult a medical professional before participating in activities or exercises.